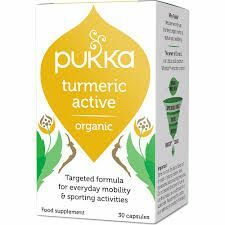 With Turmeric Active you can rediscover the flow of movement for everyday mobility and sporting activity. Take 1 or 2 capsules a day with food. Please note turmeric is fat soluble. When taking turmeric supplements you should take them immediately after a meal or with organic fish oil or other organic oils. Black pepper in your diet also helps turmeric absorbtion. Keep out of reach of young children. Seek professional advice during pregnancy. Do not exceed the recommended daily intake. Do not use this product as a substitute for a varied diet. Allergy advice: contains Celery Seed. Storage Conditions Store away from direct sunlight below 30oC.